These crisp bite-size crab cakes are the perfect appetizers to serve at your next large gathering of friends and/or family. Mix first 5 ingredients in large bowl until blended. Stir in celery and onions. Add crabmeat and 3/4 cup bread crumbs; mix well. Roll into 40 balls, using about 1 Tbsp. crab mixture for each ball. Flatten into patties; coat evenly with remaining bread crumbs. Discard any unused bread crumbs. Heat 2 Tbsp. oil in large skillet on medium heat. Add crab patties, in batches; cook 2 to 3 min. on each side or until firm and golden brown on both sides, adding remaining oil as needed. Drain crab cakes on paper towels. 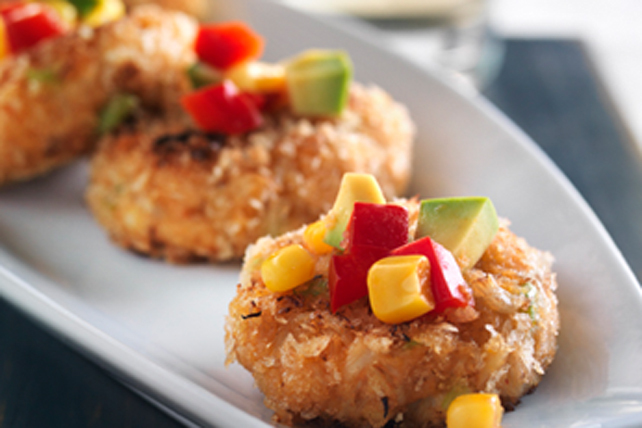 Combine corn, avocados and red peppers; spoon over crab cakes. After zesting the lemon for use in this recipe, cut the lemon into wedges; squeeze over corn mixture and crab cakes before serving. The crab cakes can be cooked ahead of time. Cool, then refrigerate up to 24 hours. When ready to serve, bake in 350°F oven 5 to 7 min. or until crisp and heated through. Serve topped with corn mixture.